← My #CoffinHop flash story challenge! The baseball saved my life. But let me start at the beginning. As Melinda, the crowd-warmer girl had a meltdown over the t-shirt bazooka, I almost missed the alien. I thought maybe he was the mascot for the other team. All I wanted was for Melinda to put on my head so I could go on the field and work the crowd. The panda suit was so plush had only satiny plush pillows for hands, and the rotund stuffed body suit did not allow me to bend. The alien passed behind her and gave me a dirty look. I could tell it was an alien by the enormous head and glassy black eyes. I wondered if it was as hot inside the alien suit as it was inside of mine. Melinda handed the bazooka to another girl and made a big frustrated show of putting on my head for me. I flounced out onto the field, and the home team roared. 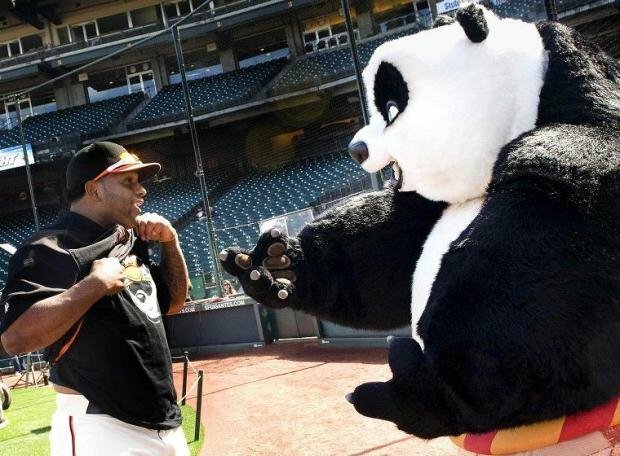 The DC Pandas were the newest Triple-A baseball team, but they already had a fanatic following that rivaled the majors. At least in the Metro area. I’d been a hit since day one, and I loved the attention. The alien was nowhere in sight, not near the opposing team’s dugout, not near the stands where the guest fans sat, not near home plate. I don’t know why I felt I should keep an eye out for him, as best I could through the eyeholes of my stuffy suit, but you gotta know the competition. Crack! The first pitch happened behind my back, and I spun to see a long pop fly ball, caught by the shortstop. First pitch, first out. This game is going to be good! I capered around, peering up into the sky as if still looking for the fly ball. The crowd roared with laughter. Melinda appeared, the other girl in tow, stuffing a rolled t-shirt into the bazooka. More cheers erupted from the audience. The thousand watt smile she gave them belied the words I’d heard her utter before we took the field. She raised her arm and pulled the trigger. No t-shirt emerged from the cannon. She pulled the trigger again and it flew into the stands like a surface to air missile. Right into the bulbous green head of the alien. A horrible gurgling cry erupted from the creature, and I could see its strange skull illuminate through its skin. I stood transfixed as it pulled out a metal object that could only be a gun. I heard a cry from behind me and everything was dark as my panda head fell forward. I was sure I’d been hit by the alien’s ray gun. I fell to the ground, my head fell off, and I saw the baseball that’d saved my life. I smiled, breathed in the fresh air, which smelled of barbecue, looked up, and saw the charred remains of Melinda behind me. I hope we never play that team again. The above was written during a writing exercise (polished slightly for its public debut) given the following prompts / props: a baseball, a stuffed panda bear, and a human skull (rubber facsimile). Click here to read RJ Sullivan’s story from the same prompts. Special thanks to Nicole Cushing for assembling the props and running the exercise. This entry was posted in Blog, Fun Stuff, Writing and tagged flash fiction, rj sullivan, short fiction, writing. Bookmark the permalink.